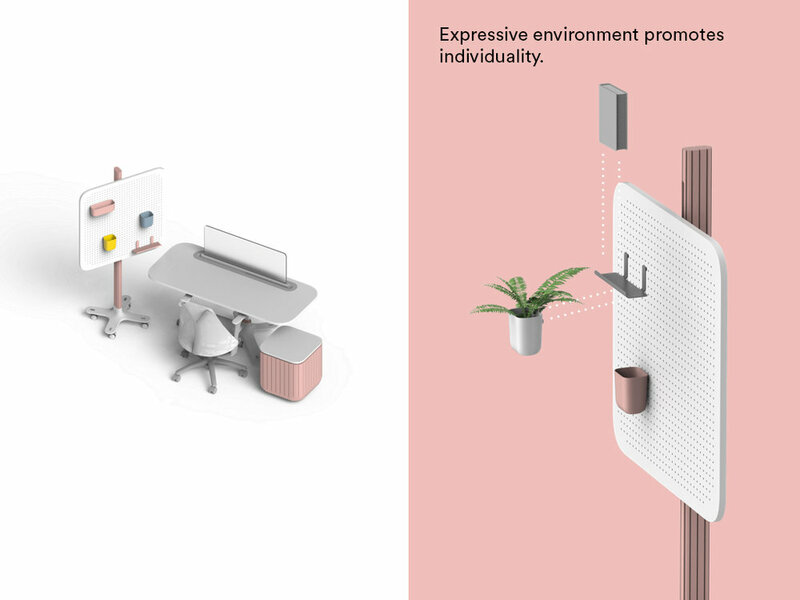 An office furniture system for creative work environments with an operation system embedded to enhance collaboration and foster innovation. *This is a team effort from Interface Design. These units are able to layout in preferred ways to fulfill company's needs, whether it's private working, stand-up meeting or project sprint. Connec Totem is like your ID to initiate the system. Each color represents an individual. Use the Totem as sketch pen, the screen as white board, collaboration is able to take place at any Connec Desk at anytime. Moreover, Connec records down the ownership of any idea, modification and feedback. All the archives go into a digital road map that showcase every milestone of the team project. So anyone including the newcomers could access and trace back to learn project how the project has progressed and evolved. Side buttons embedded in desk surface give instant access to any crucial point of the work. Let the creative juice flow! The screen of Connec Desk is able to transfer the working environment between private and public by adjusting its opacity.